Sushmita Sen is a diva beyond any comparison. The first Miss Universe from India who won the crown in 1994 has ensured that people look up to her even today. 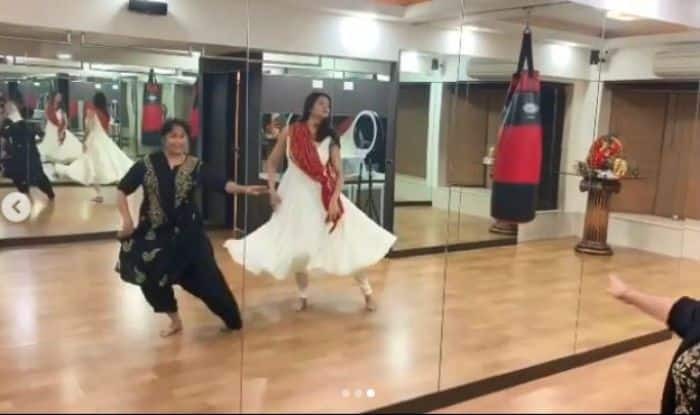 Recently, Sushmita Sen took to Instagram to share a video on her timeline, in which she can be seen learning classical dance Kathak from her guru ma. In the video shared by Sushmita, the actress can be seen dancing and matching the steps of her teacher. Sushmita looked stunning in a white anarkali suit and red dupatta. She captioned the video as, “ #12345  A simple count that can lead to such happiness, poise, awareness, balance, rhythm & grace❤️ This beautiful soul @pritam_shikhare who I consider as both my Maa & Guru, always takes me back to basics, a source that is pure & divinely childlike! ! A place where I twirl & laugh, dancing with abandonment to the sound of 12345!! !❤️ I love you Pritam Maa, keep spreading your infectious positive energies, the world needs it!! ! #sharing #happiness #love#ayearofcelebrations #25years#missuniverse1994 #india ❤️I love you guys!!! !”.